I think this too-hot weather is getting beyond a joke now. Can't we have some snow or something? However the chillis in the garden are loving the heat. So here is a card to celebrate. The stamp set is a sheet of chilli stamps from Rubberdance - they don't seem to be currently available but they are a real boon for anyone with a chilli head in the family. For the background I stamped sentiments from the set over the blue card using a Versamark pad to give a watermarked look. I drew a band across white card the width I wanted, then stamped the large chillis to overlap the edges, fussy cut it and erased the pencil markings, then coloured the chillis red and green and stamped tiny ones to fill the background. Very much a hot and cool card! 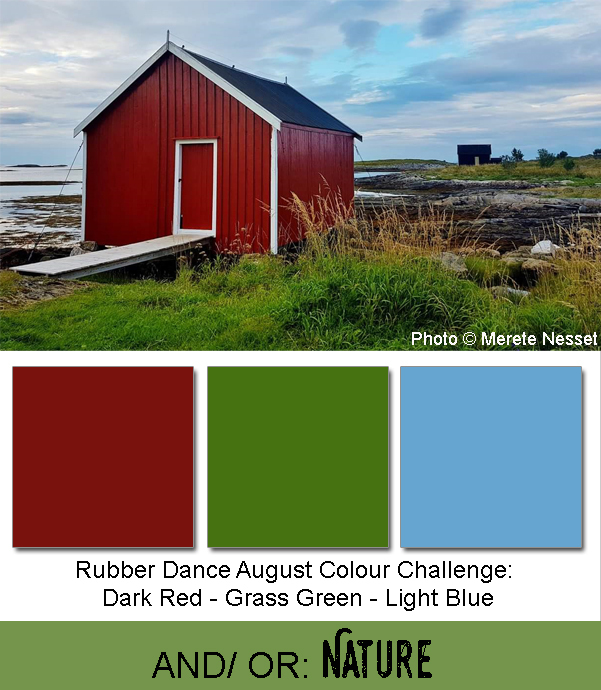 I'm sharing this with Rubberdance where I have chosen to use the colour theme. This is such a cool card Jane - no pun intended! It's a brilliant design. I love the use of of the over the edge stamping and fussy cuting out the band. Makes the card stand out in a great way!